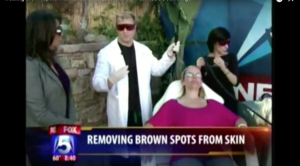 Living in beautiful San Diego has its advantages but enjoying the bright outdoors can cause a variety of problems for your skin, including sun damage and pigment problems like brown spots. Although typically harmless to your health, these skin conditions can make you frustrated and even self-conscious. And, if left untreated, they can even lead to more serious problems. At Cosmetic Laser Dermatology, we have a wide variety of treatments to correct sun damage or brown spots, including the largest selection of laser treatments in Southern California. We also carry high-quality, medical-grade skincare products and sunscreen to ensure that the signs of sun damage do not return or worsen. Our team of board-certified dermatologists and cosmetic surgeons and skin care experts have the knowledge and experience to target and fully correct common problems caused by chronic sun exposure. No matter what you call them, they often appear as flat, freckle-like round spots with a regular or irregular border. These spots can be differentiated from regular freckles due to their color (brownish-gray) and size (as large as a nickel or more in many cases). Furthermore, they tend to fade less quickly than freckles and are more easily noticeable if you have light skin, although they are also common if you have darker, more tanned skin. You might refer to them as age spots because they are frequently seen in older adults, but this is because they can develop slowly over time as the skin produces excess melanin due to the regular sun exposure. Since brown spots develop mainly due to the sun, they commonly appear on the hands, arms, legs, face, and shoulders, particularly on the left side of your face and body as a result of driving! Obviously, the best way to minimize your risk is to avoid overexposure to the sun, but you know how difficult that can be in San Diego! 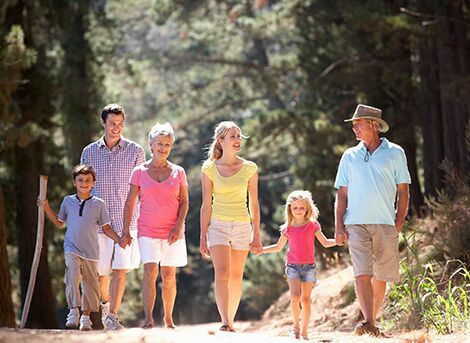 cdc.gov offers tips to reduce your exposure to the sun and prevent sun damage. As a result, you may have brown spots regardless of how careful you’ve been. Our board-certified dermatologists understand that this type of sun-damaged skin can impact your appearance and self-esteem, as it can make your skin look aged and even unhealthy. In fact, some more dangerous cancerous lesions can often resemble the harmless brown ones. This means that if you notice one or more spots, you should schedule a consultation today at Cosmetic Laser Dermatology to assess whether or not your sunspots are harmless. If it is determined that your sunspots could be cancerous or pre-cancerous, we can refer you to West Dermatology Skin Cancer Center, our sister practice just next door, where you can be evaluated further and discuss other, more relevant treatment options. Our team of experts at Cosmetic Laser Dermatology has made it easy to treat pigment problems and skin damage from the sun. We offer a wide array of services and procedures, all of which can be tailored to suit your needs and meet your aesthetic goals. Laser treatments are very effective for diminishing hyperpigmentation and other discoloration issues. By sending specific pulses of light energy into the affected area, the pigmented lesions break up and are absorbed by the body before being gradually eliminated by the body’s natural processes. One of the best laser combinations for improving sun spots and brown spots is the Lumenis UltraPulse Encore with the Sciton Erbium. 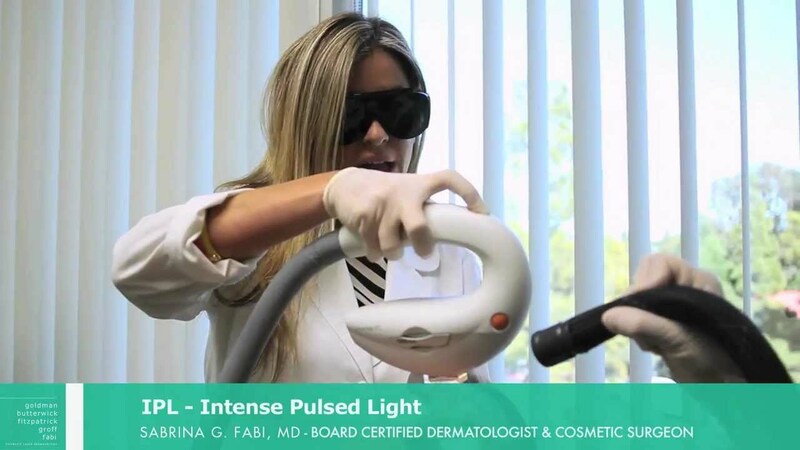 Intense Pulsed Light (IPL) – Using high-intensity pulses of light, IPL penetrates the skin and triggers a natural healing process in the skin that eliminates hyperpigmentation, texture, and other skin irregularities. 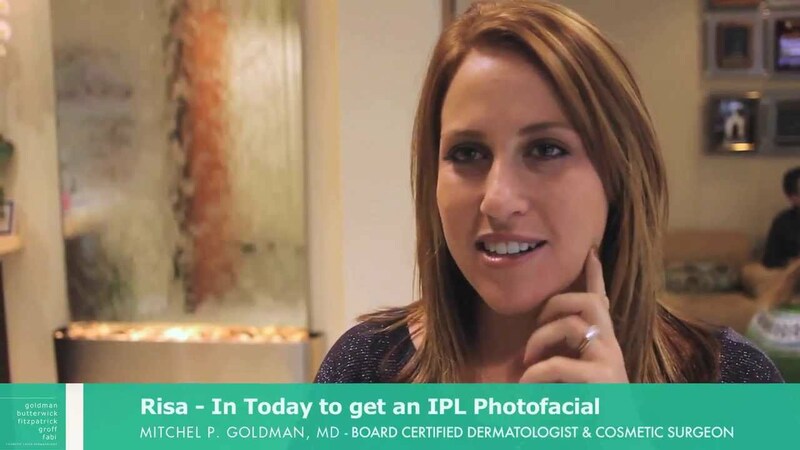 Our most popular IPL treatments, Lumenis M22 and Lumenis One, are excellent for treating a broad range of skin concerns, including sun damage, age spots, rosacea, facial veins, birthmarks, seborrheic keratosis, and more. Q-Switched Ruby/Q-Switched Alexandrite Laser – These two lasers of different wavelengths specifically target pigmented skin to break up the abnormal pigment and allow it to be exfoliated from the skin surface. 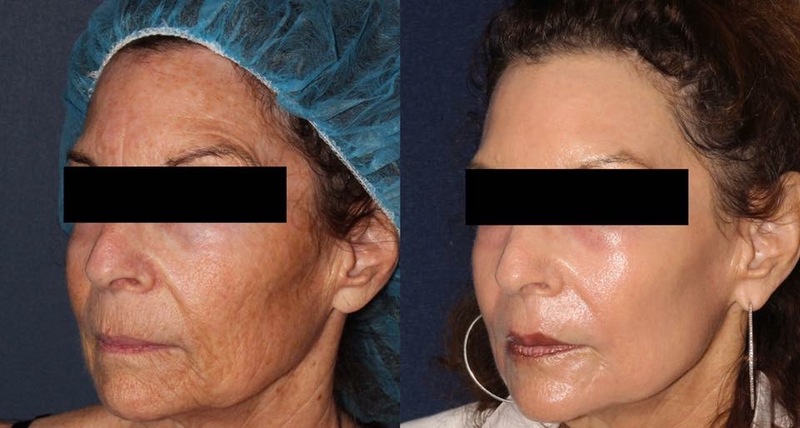 PicoSure/Picoway – Delivering quick pulses of light energy at a rate of 100 times shorter than other light therapy options, PicoSure and Picoway’s picosecond lasers offers an unparalleled impact on hyperpigmentation, allowing patients to undergo fewer treatments in order to achieve clearer skin. 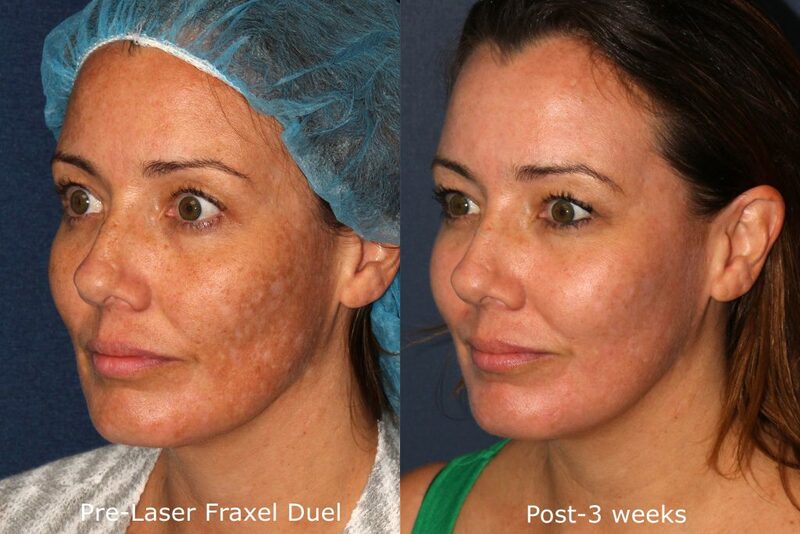 Fraxel Dual – Utilizing a highly effective fractional 1927 nm Thulium laser, Fraxel Re:Store Dual targets the abnormal skin to eliminate unwanted pigmentation, resulting in clearer, smoother, healthier skin. The treatment targets only a “fractional” portion of the skin, ensuring that the healing process is shorter than more aggressive resurfacing procedures. Photodynamic Therapy (PDT) – Also known as an ALA treatment or a Levulan/Amaleuz photofacial, PDT combines the use of a photosensitizing topical medication with rejuvenating light therapy to trigger cell turnover for a clearer, healthier skin. Combination therapy – For comprehensive skin rejuvenation, we often combine effective sun damage and pigmentation treatments, such as one or more lasers with microdermabrasion, micro needling, chemical peels, or facials. Additionally, patients can also undergo anti-wrinkle treatments, such as Botox/Dysport/Xeomin, facial fillers, or non-invasive skin tightening Ultherapy or Thermage FLX for a youthful appearance. While topical bleaching agents can be effective for darker patches of pigmentation, the results are usually mild and temporary. For sunspot treatment that produces better and longer-lasting results, laser therapy is a better alternative. 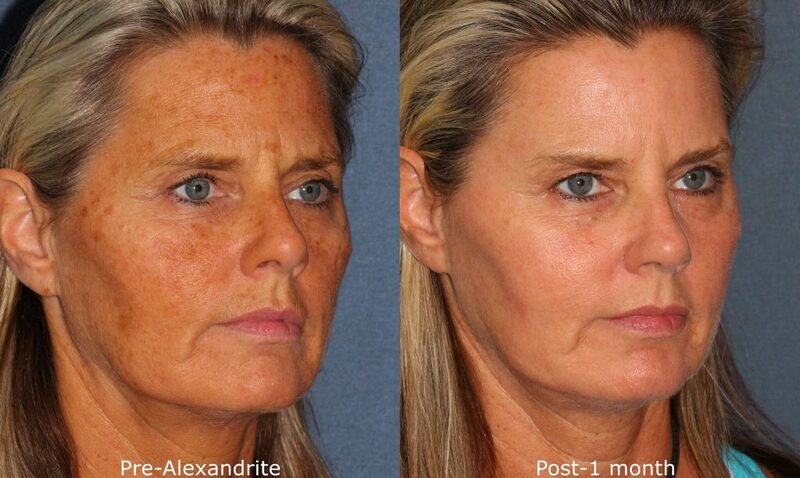 For example, Intense Pulsed Light (IPL) is a minimally-invasive method of erasing sunspots and freckles. 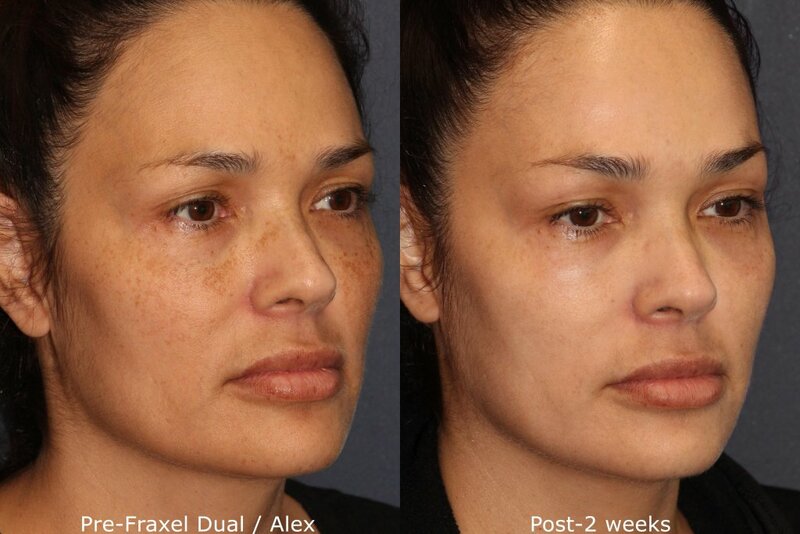 Fraxel Dual uses resurfacing technology to safely erase pigmentation issues. Chemical peel is excellent if you have minor pigment-related issues. Two of the most effective peels that we offer are the Signature Peel-Jessner and Glycolic Peel. By removing the micro-thin top layer of the skin, both procedures transform the surface of your skin by lightening hyperpigmentation and refining pores. Furthermore, if you have a special occasion just around the corner, a chemical peel is a quick, easy, and non-invasive way to completely rejuvenate your skin’s appearance with virtually no downtime. A microdermabrasion treatment uses a vacuum tip handpiece and very fine crystals to remove a razor-thin layer of skin to reveal fresh, new skin that looks fantastic. For both chemical peels and microdermabrasion treatments, results are noticeable immediately and then improve over time as the new layer of skin emerges. For optimal results, a series of micro-treatments and/or chemical peels may be suggested. In addition to advanced dermatologic treatments, we carry a top-of-the-line selection of medical-grade skincare products to not only nourish and beautify your skin, but also protect against sun damage. Learn about our range of proven sunscreen products from esteemed brands, such as SkinMedica, Skinceuticals, Neocutis, Calecim and more. At Cosmetic Laser Dermatology, our physicians are experts at treating and correcting sun damage, brown spots, and various other pigment-related issues. Our dermatologists have undergone extensive training and even developed highly-refined techniques to improve your skin and rejuvenate your appearance. We urge you not to ignore pigmentation issues and sun-damaged skin, as they can become more dangerous if left untreated. If skin cancer is suspected, we can refer you to our sister practice, West Dermatology Skin Cancer Center, for further assessment and treatment options. At Cosmetic Laser Dermatology, our team realizes the importance of good skin health not only on your appearance but also on your overall health and wellbeing. With more than 100 years of combined experience, we assess your skin condition and work with you to determine the customized treatment plan for you, just as we have done for more than 100,000 of your neighbors in La Jolla, San Diego, and neighboring communities. To learn more, visit medlineplus.gov or schedule a consultation today at Cosmetic Laser Dermatology. 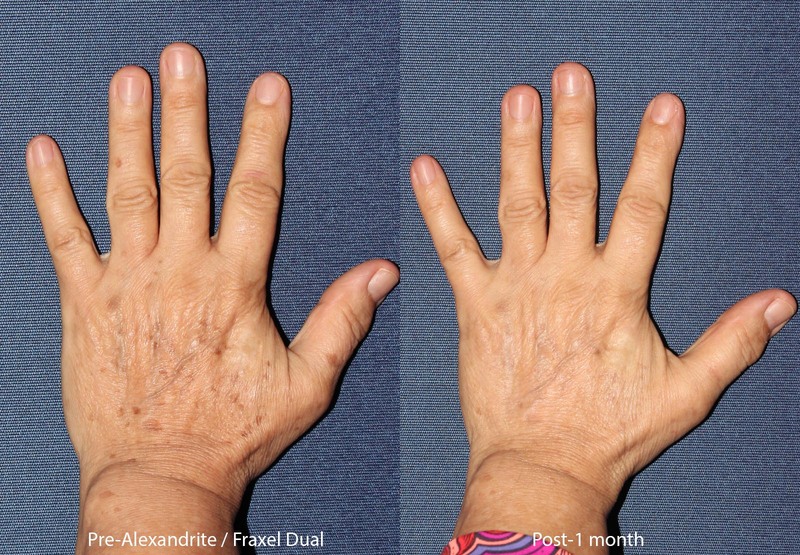 Dr. Groff used the Alexandrite laser to treat this patient's brown spots on his hands. Results are 1 month post-op. 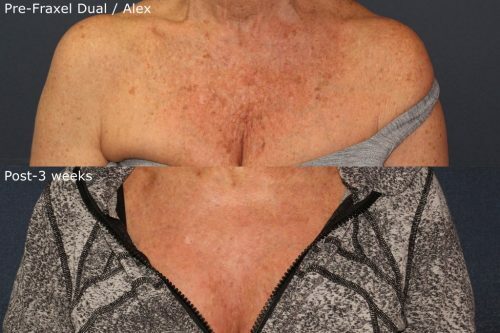 Dr. Groff treated this patient's sun damage and brown spots with the Alexandrite laser. Results are 4 weeks post-op. 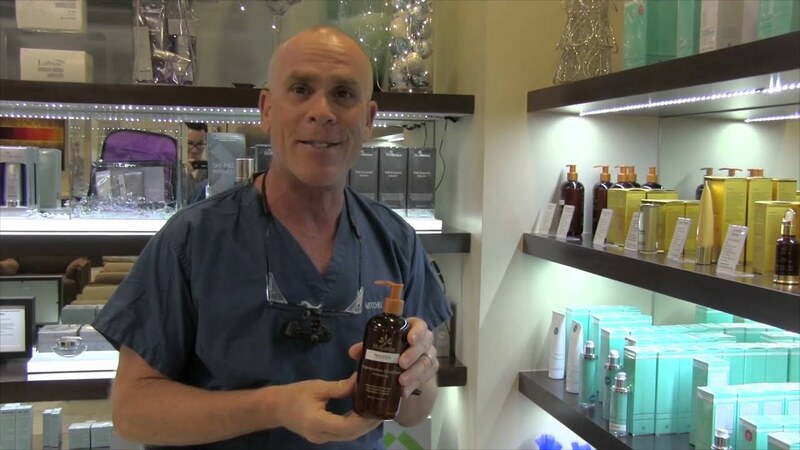 Q: What is the best treatment for hyperpigmentation? A: Because various degrees of hyperpigmentation exist, there is no one-size-fits-all solution. It all depends on your goals, condition, and the extent or severity of the pigmentation. However, at Cosmetic Laser Dermatology, we offer a range of highly advanced systems, including PicoSure, Picoway, IPL, Q-switched Ruby and Alexandrite lasers and Fraxel Dual, which deliver the best, most consistent results. Q: How long before my treatment shows results? A: This depends on the type of treatment you choose to undergo. Sometimes a single visit can show the noticeable results you want, while at other times, 2-3 treatments are necessary. You can see noticeable results in hours or days in some cases, while in others, it can take months for the full effects show. Discuss your unique needs and goals with a dedicated dermatologist to determine which treatment can provide you with the best results. Q: Who should perform laser treatments for pigment conditions? A: To ensure you receive the safest, most effective results possible, you should always get laser treatments from a board-certified dermatologist. At Cosmetic Laser Dermatology, our board-certified doctors have the training, experience, and skill necessary to help you achieve the aesthetic results you want as well as lower the risks of permanent laser damage. Q: Does Cosmetic Laser Dermatology conduct clinical trials regarding pigment conditions? A: Yes. Cosmetic Laser Dermatology is renowned for its participation in new clinical trials. For more information about trials we are currently conducting, please visit our research page and contact our office today. Q: Am I a good candidate for laser treatment or a chemical peel? A: This can be confirmed during your initial consultation with our dermatologists. 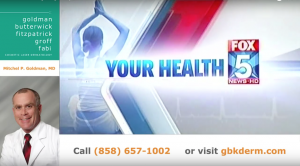 At that time, you can share your concerns and ask questions to learn about the best treatment for you. Since both procedures are safe, effective ways to address skin conditions and maintain healthy skin, neither you nor we will know which is best until we meet with you to learn your goals and assess your condition. Q: What is the best treatment for melasma? 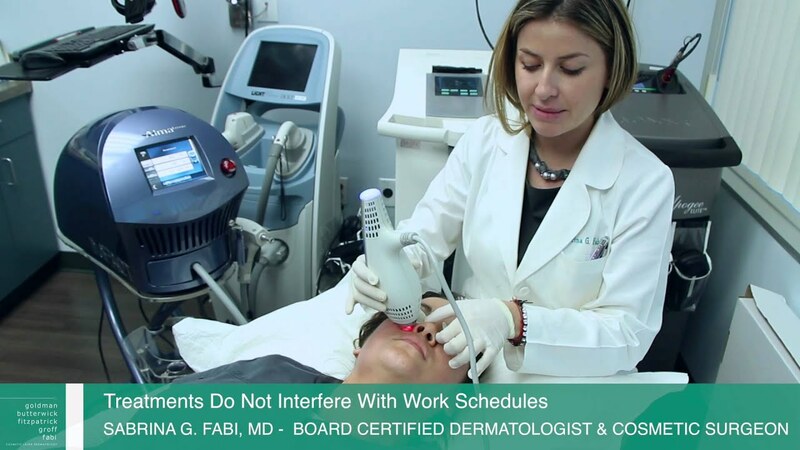 A: To determine the best treatment, it is important to meet you in person and discuss your case, in general, there are two safe, effective methods – fractional laser resurfacing and intense pulsed laser (IPL) with a medicated cream. The cream is better absorbed by the microscopic holes in your skin from the fractionated laser treatment while the IPL is better for treating the vascular aspect of melasma.